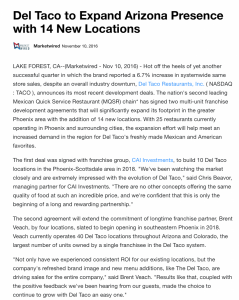 LAKE FOREST, CA–(Marketwired – Nov 10, 2016) – Hot off the heels of yet another successful quarter in which the brand reported a 6.7% increase in systemwide same store sales, despite an overall industry downturn, Del Taco Restaurants, Inc. ( NASDAQ : TACO ), announces its most recent development deals. 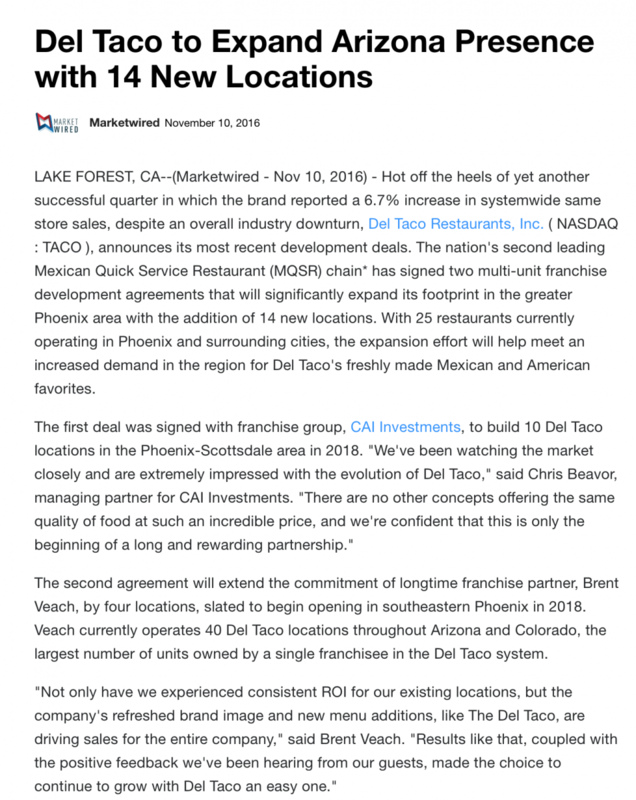 The nation’s second leading Mexican Quick Service Restaurant (MQSR) chain* has signed two multi-unit franchise development agreements that will significantly expand its footprint in the greater Phoenix area with the addition of 14 new locations. With 25 restaurants currently operating in Phoenix and surrounding cities, the expansion effort will help meet an increased demand in the region for Del Taco’s freshly made Mexican and American favorites. The second agreement will extend the commitment of longtime franchise partner, Brent Veach, by four locations, slated to begin opening in southeastern Phoenix in 2018. Veach currently operates 40 Del Taco locations throughout Arizona and Colorado, the largest number of units owned by a single franchisee in the Del Taco system. 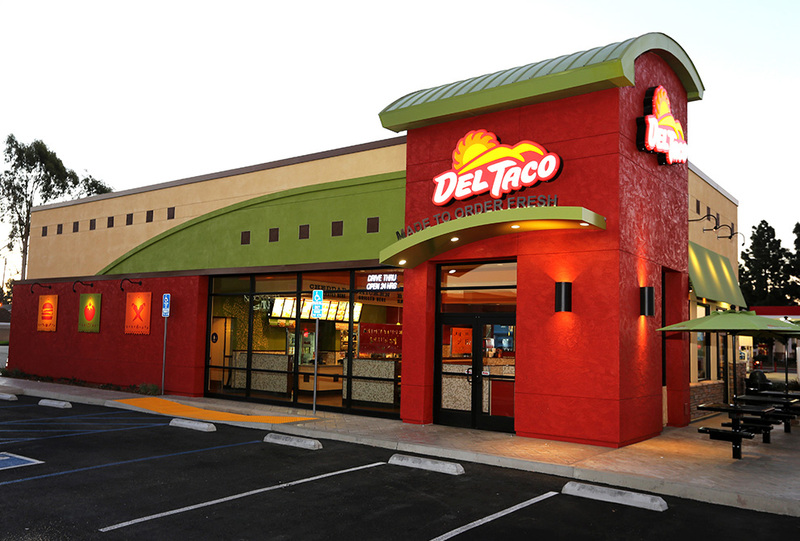 By offering guests the quality and freshness of a fast casual restaurant at the value and convenience of a drive thru, Del Taco owns a unique space in the QSR+ segment. With its Fresh Combined Solutions strategy, Del Taco aims to generate positive guest experiences and broaden appeal through a series of operations initiatives, including new equipment and enhanced training, as well as a marketing makeover with the launch of its UnFreshing Believable 2.0 campaign. The brand refresh campaign highlights Del Taco’s dichotomous menu of both Mexican and American favorites such as burritos and fries served at category leading prices, along with the use of quality ingredients and fresh preparation in every restaurant’s working kitchen. Committed to the success of its franchise partners, Del Taco provides substantial support and resources, from site selection to hands-on training to marketing materials, necessary for sustaining and strengthening an operator’s business. As Del Taco pursues steady national growth, the company is actively recruiting passionate and qualified partners to bring Del Taco’s delicious favorites to more guests in both new and existing markets. Candidates interested in franchising are encouraged to register and take part in an informational webinar at www.deltacofranchise.com.